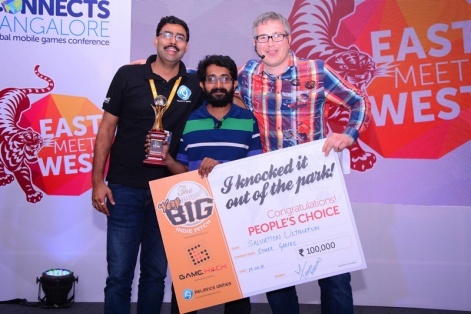 After a successful showing last year, the Very Big Indie Pitch is returning for Pocket Gamer Connects Bangalore 2016. As we revealed back in February, the Very Big Indie Pitch will be linking up with Reliance Games' Game Hack game development competition. The popular VBIP event will see the top 20 teams go head-to-head as they pitch their creations to international media and popular industry figures. There's just 15 days to go until the deadline for submissions, so if you were thinking about entering, now is the time to take the plunge. There's the small matter of getting your game in front of leading media influencers and potential publishing partners. Not to mention the financial rewards. Reliance is stumping up for the following prizes. This year, Game Hack will also give the opportunity for the best games in The Very Big Indie Pitch to get published within India, as well as the opportunity to take them globally. The Very Big Indie Pitch has helped many aspiring developers take the next step in their career - such as Ether Games who won last year. The VBIP is a massive opportunity which provides a great launching pad for anyone with a great concept and a cool idea. The investment from Reliance will guide the developer through the pitfalls of creating, marketing, and promoting their game. Everything from improving KPIs to analysing the design and product perspective, the developer will gain unique and unparalleled insight. There will also be strong media visibility by being featured on the App Store, and the global publishing initiative which not only gives the game instant awareness, it supports the developer with community building, and understanding how to achieve brand recognition for their title. This is a fantastic opportunity for anyone who has ever dreamed of making a game, and putting it into as many hands as possible. Not only will you gain valuable, expert insight from our panel of judges, your game could be the next big thing in the mobile space. So, what are you waiting for? Sign up now, and knock us out of the park.